Charlie Winkel was born at Waraba Creek Cabulture QLD in 13th May 1904. He was one of 10 children. Charlie grew up at Mt Mee. He left school at an early age, and worked in the timber industry. In 1928 he married Kathleen Phillips at Ravenshoe in QL, they had 6 children, 3 boys and 3 girls. Because of difficult times during the Great Depression he did not return to compete at Sydney Royal Show until 1938. This was the year that Sydney Royal Titles were designed to be World Titles. 1939 Charlie’s brother won the 13 inch World Tree-felling Championship. Carlie did not return to the Sydney Royal until the early 1950’s. He won 8 Queensland 15 inch Standing Block Championships at Brisbane Exhibition. 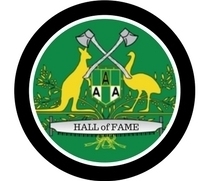 Charlie Winkel is the only man to have won the 13 inch Tree-felling Championship, 15 inch Underhand Championship, 15 inch Standing Championship and Double Handed Sawing Championship at the Sydney Royal Show. 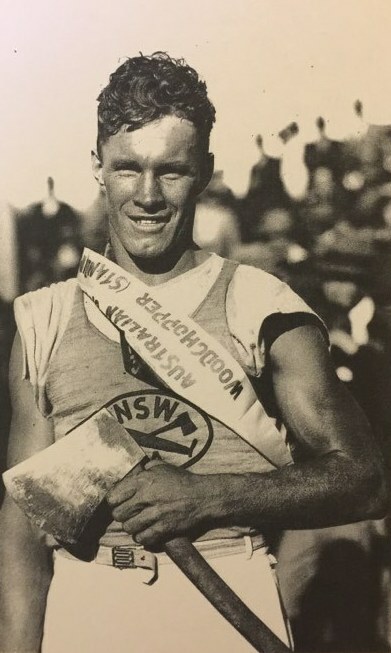 He was deprived of Legendary Status by the fact that 4 of these titles were called NSW, Australian and Commonwealth Championships prior to the event being renamed World Titles in 1938. Charlie Winkel passed away in Dorrigo NSW aged 89 years. R.I.P.